DHS have been servicing boilers in the Bristol area for over 40 years. All our engineers are Gas Safe registered meaning you can rely on us to keep your boiler working safely and effectively. We service all major brands and types of boiler, so whatever you have installed we can keep it in top condition. We offer a single, fixed price of £79.80 for a routine wall mounted or floor standing gas boiler service and £135 for an oil boiler service. To book a boiler service in Bristol or the surrounding area call DHS today on 0117 924 7200. Most boiler manufacturers, including leading brands Worcester Bosch and Vaillant, recommend having your boiler serviced at least once a year. Getting an annual boiler service is usually a condition of any warranty on a new boiler and regular boiler servicing provides a number of important benefits that can ultimately save you money. Cut your bills – Having an annual boiler service will keep your boiler working efficiently by making sure all of its individual parts are clean and in good condition. This will allow it to burn its fuel efficiently, getting the most heat from each unit of fuel used. This means you will use less fuel for the same results, saving you money. Reduce breakdowns – Many breakdowns can be avoided through good boiler maintenance. By keeping your boiler clean and identifying any potential problems early, you reduce the chances of your boiler stopping working unexpectedly. Not only does this prevent you from being left without heating or hot water, it can also save you money because it is usually cheaper to prevent a problem than fix it after your boiler has broken down. Make your boiler last longer – Regular boiler servicing can keep your boiler going for longer, potentially adding years to its life. This not only allows you to put off the cost of a replacement boiler, it also helps the environment by cutting down on waste. Here at DHS, we have the expertise to keep your boiler working at peak efficiency helping to reduce your bills, save you from the hassle of a broken boiler and increase your boiler’s lifespan significantly. To find out more about the importance of having a regular boiler service, why not get in touch with the DHS team? 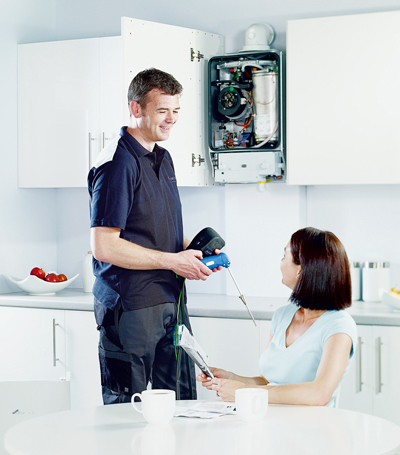 Our professional heating engineers are on hand to provide servicing advice and maintenance.